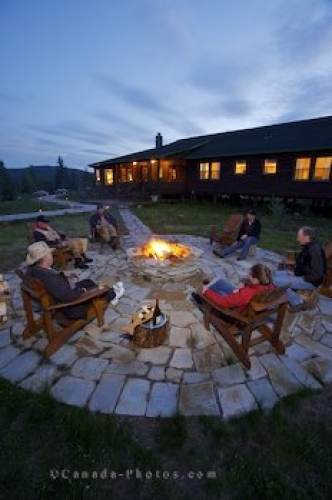 Guests at the Rifflin'Hitch Lodge in Southern Labrador, Canada gather together in the evening hours to enjoy the firepit on the patio. The firepit is a great place to swap fishing stories while enjoying a few cocktails with new friends. People gathered around the Fire pit, Rifflin'Hitch Lodge, Eagle River, Southern Labrador, Labrador, Newfoundland Labrador, Canada. Picture of the patio firepit at the Rifflin'Hitch Lodge in Southern Labrador, Canada.